This resort was designed especially for families, couples and groups, and is the best option for enjoying a top holiday surrounded by the comfort of home. 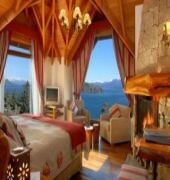 Built using the trunks of gnarled cypress trees, stone and glass, and featuring a typical mountain style, the resort is nestled in the hillside, surrounded by picturesque cypress forests. The visual splendour of the lake and mountains enhances the resort's architectural beauty. It comprises a total of 28 rooms, including 9 suites, 10 junior suites and 7 apartments. Facilities on offer to guests include a lobby area with a 24-hour reception and check-out service, a hotel safe, a currency exchange facility, a cloakroom and lift access. The kids' club offers entertainment to smaller guests and there is a children's playground located in the cypress forest. Guests have a cafe, a bar and a restaurant at their disposal and they will appreciate the wireless Internet access. They can also take advantage of the room and laundry services. 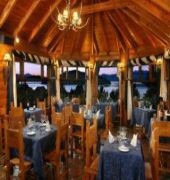 There is a car park and covered garage parking for those arriving by car and it is also possible to hire bicycles on the premises.This hotel enjoys an ideal location opposite Lake Nahuel Huapi, in the region's 'Lake District', just 5 minutes away from Bariloche. It lies just 1 km from the best beaches and 10 minutes from the Cerro Catedral ski area. The beauty of the lake is enhanced by a beautiful cypress forest and a grove of silver poplars surrounding the various cabins and suites. It is 7 km from the tourist centre, with its beach and nightspots, and 15 km from the bus and train stations.